Whatever I want to write whenever I want to write it. 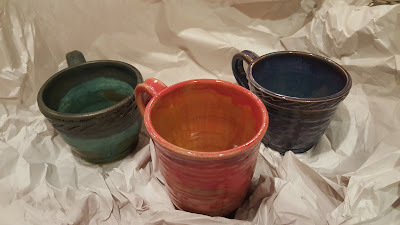 I bought these beautiful mugs at my brother's art show Saturday. Dude throws pots, not shade. He's been at it for about 25 years, and just keeps getting better. By day, he teaches art to middle schoolers, a noble endeavor indeed. I guess all the stress that provides fuels his creative energy in his ceramics studio. Now, myself, I am more verbal than visual. I'd rather read the transcript than watch the video. When it comes to movies, I'll take the snappy dialogue (Mamet, Sorkin, Coen) over the langorous pastoral pastiche. but, nevetheless, I can hold these mugs in my hand and appreciate their energy and vitality, even in a static form. And coffee was meant to be drunk from a mugs like these, its full bouquet greeting you as you sip. So much better than sucking it through a tiny hole in a plastic lid, so you can burn your lips and the tip of your tongue. But, anyway, art. My appreciation of art falls mostly in the "I know what I like" basket, but upon reflection, I realize that I have always enjoyed the rare visits I have made to museums and exhibits. I specifically recall visits to the Baltimore Museum of Art and the Museum of Modern Art in New York, and while, I couldn't tell you exactly what did it, I remember stopping at length several times to consider the work before me. I know, that's the whole point. But we live in a world of constant distraction, a world that seeks to offer so much distraction in so many formats that we sometimes feel lost without it, and we seek it at every pause. So here, for a moment, a thought about the value of the pause and thought, not the interruption of the next. One of my favorite exhibits was called Word Play, Contemporary Art by Xu Bing at the Arthur Sackler Gallery in Washington, D.C. I saw it about 15 years ago for reasons that I cannot remember. Xu Bing is a Chinese artist who manipulates forms and language in order to radically change their meaning and he does this in visually stunning fashion in large and small scale. There are lengthy academic treatments of his work, but for me that day, he had created magnificent visual oxymorons, like square pegs that fit round holes or giant birds that soared despite appearing too heavy to move let alone fly. He was born in China in 1955 and suffered government oppression for his work before fleeing to the United States after the Tiananmen Square Protests. He returned to his native China in 2008 as the Vice President of Central Academy of Fine Arts. So, now what? Well, I need to get to museums more often, for one thing. Because art is really important. And I don't think it's coincidence that this week I am thinking about an artist born in a totalitarian state who was criticized for his perceived antigovernment works. You figure out the rest, you know, the eye of the beholder and all that. Too Much Knowledge For College? Documents uploaded. That's the message on the screen after I click "Submit" on the financial aid materials prepared for the College Board website. And that means we are finished with this phase of the application process for our younger son, once a prominent character in tales on this blog of sledding, Halloween costumes and baseball games. And now college. Later today, we'll head down the interstate to take in some Division I NCAA basketball with his older brother, and then happily schlep him and his laundry home for the weekend (he will wash the laundry himself, but save on detergent and quarters). The second time is certainly different. Easier, having been through it once just a couple years ago, and harder, mainly because there are no more after him. With only one child at home, the chemistry and the vibe of the household have changed, not to mention the schedule, grocery budget, utilities and data usage. When both leave next fall, I anticipate a silence of deafening impact. And the dog will miss them terribly. So I listen with amusement as a friend goes through the process for the first time with his oldest child. With four more, he will no doubt get more comfortable and ease off a little bit, but on this go-round, it sounds like every application has been the subject of extreme vetting. Mind you, the college tours they have taken have almost always included a major sports event or concert as part of the trip, so he has clearly taken some pleasure in the process. When he has called me to ask a question or vent some frustration, I can smile because I was in a similar mode two years ago. That first application was a strain on the already fraught dynamic of parent-teen communication, exacerbated by the technology whose mysteries result in eyerolls from the teen and brow-furrowed profanity from the parent. And of course any technological problems were immediately blamed on the obscenely obsolete computer we were using. After the first application was done, we left it mostly to him, providing the occasional signature and credit card for application fees. All in all, it went pretty smoothly. He applied to schools he liked and we approved. He got admitted and after a whirlwind 48 hours of return visits during his Spring Break, he made his choice and has found a great fit. As we go through the process again, we are much more comfortable, understanding that even though there are some similarities, there are many more differences. Son the Second has a different approach than Son the First, but I think we are on the right path. The biggest adjustment for me has been the ethereal nature of the entire process. Nothing is mailed to the schools. Everything is scanned, uploaded, clicked and confirmed. I still can't help but call and speak to someone to make sure that what I am reading on the screen in front of me is true. And I have good reason to be wary. More than one institution has mistakenly emailed acceptances to students, only to break their hearts when informing them of the error. One of the teachers at my sons' high school tells the seniors not to get too stressed out about applying to college. Even though they may not get into their top choice, "You'll get in somewhere," he says. "And a year from now, you'll be in school with hundreds or thousands of other teenagers. And no parental supervision. So what's not great about that?" This story always kills at Back to School Night. Perhaps I am informed by my own undergraduate experience. The horror show that was my three semesters as an engineering major ended when I transferred to arts and sciences. I like to say we parted on mutual accord. I was required to achieve a minimum GPA in liberal arts courses for one semester in order to make the transfer complete. I hit the number on the nose and showed up at the dean's office, transcript in hand. After a review of my putrid academic record, I was told that this might not be good enough, considering just how bad the engineering grades were. "But you wrote me a letter saying that if I got the grades on this approved schedule, I would be admitted." "Do you have a copy of that letter?" "I have it right here." "Well then, I guess you are in." And she signed my papers, and that was that. I was able to stay in school; I had already met the Doc, whom I would marry some years later, and for that I am forever grateful to alma mater. Good thing I had it in writing, in ink, on paper.